The Budweiser International Classic roster continues to take shape leading to Oswego Speedway's 200-lap Supermodified title event on September 6. 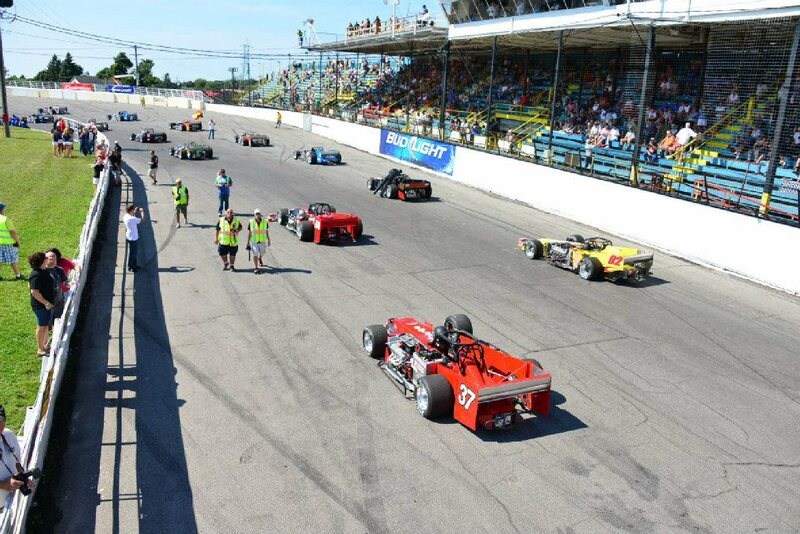 OSWEGO, NY – As preparations continue for the 59th running of the Budweiser International Classic 200 on September 6, a healthy list of Supermodified veterans and newcomers are looking to make their mark on the ‘Steel Palace’ come Labor Day Weekend. The Budweiser International Classic roster continues to take shape leading to Oswego Speedway’s 200-lap Supermodified title event on September 6. 0 – Tim Snyder (Northfield, NH): Tim Snyder’s first career Supermodified victory came in the Budweiser International Classic 200 back in 2001 and Snyder would no doubt like to relive that glory in 2015. Showing great speed at times this season; Snyder ranks 10th in the Speedway’s driver standings with five top ten finishes. A ninth place finish in the 2014 International Classic proves Snyder still has his long distance prowess, and if the ‘Zero Hero’ can again go the distance, he will no doubt be there again. 00 – Joe Gosek (Oswego, NY): A three-time champion of the International Classic in 1991, 1992, and 2002 – Joe Gosek has had an up and down season through 2015. Driving both his own No. 00 and a machine owned by John Nicotra this season, Gosek has mustered four top five finishes on the year. Gosek will return to the wheel of his own machine for the Classic and hopes to be in contention to score another top five run, as he did in 2014. Once Gosek qualifies for the 200, it will mark his 36th consecutive Classic drive. 01 – Dan Connors Jr. (Oswego, NY): Dan Connors Jr. will be a driver to watch come Classic Weekend as he continues to work the bugs out of a freshly reconstructed machine, redesigned by Hawk Jr. Fabrication. Battling some health issues in recent weeks, Connors has not been at wheel for quite some time, but the new orange Connors machine will no doubt have speed if Connors is up to the task. Still in search of his first career victory at Oswego, Connors has all the tools necessary to give the No. 01 a top five drive in the International Classic. 02 – Brandon Bellinger (Fulton, NY): Brandon Bellinger joined his grandfather Ed Sr. and father Ed Jr. as feature winners at Oswego Speedway this season, behind the wheel of the patented No. 02. New found speed befell the Bellinger crew at the midway point of the season and since that time Bellinger has been a threat week in and week out. Renewed confidence and a seventh place finish in last year’s 200 has Bellinger primed for a top five battle in this year’s International Classic. 05 – Jeff Abold (Baldwinsville, NY): Showing the same veteran abilities of his track champion father Pat, Jeff Abold fired a shot across the bow of the Novelis Supermodified division in 2015 driving his homebuilt No. 05 racer. Sitting seventh in the series standings heading to Classic, Abold has eight top ten finishes this season, tied with championship hopefuls Otto Sitterly and Bob Bond. While the No. 05 may not have front row speed, the Abold team has proven that reliability and a heady driver are what it takes to compete weekly in the Supermodified division. In many people’s eyes Abold, who took third in his first International Classic back in 2007, is a podium pick and potential upset winner of this year’s 200. 06 – Dave Cliff (Oswego, NY): Dave Cliff was initially registered to compete with his family owned No. 06 Supermodified in the 59th annual International Classic, but recent developments have placed the former SBS track champion in the Danzer Racing No. 72 Supermodified. With Cliff piloting the No. 72, the No. 06 will be kept solely as a back-up ride for Cliff should the No. 72 or No. 52 of Danzer run into issues. 1 – Shawn Muldoon (Oswego, NY): A former Oswego Speedway Novelis Supermodified track champion, Shawn Muldoon has been at the Speedway twice with the No. 1 in 2015. Firing issues plagued the team their first night out and on the second night Brian Sobus would drive the machine in the main event after developing issues with his No. 79. Muldoon missed the cut for the Classic one year ago by only one position and hopes to rebound this season, putting the No. 1 in the Classic for the first time in two years. 2 – Dave Shullick Jr. (North Ridgeville, OH): The current ISMA Supermodified point leader and defending champion of the Bud Light ISMA Super Nationals, Dave Shullick Jr. will once again drive out of the John Nicotra Racing stables in 2015. Shullick has competed in non-wing action at the Big O a couple times this season in his brand new Hawk Supermodified, with limited results. Nicotra and Shullick hope that Classic Weekend will be their peak performance with Shullick battling teammates Sitterly and Davey Hamilton for victory. Shullick took 18th in the 2014 running of the Classic. 5 – Tim Devendorf (Brewerton, NY): Tim Devendorf has campaigned a new Hawk Supermodified in 2015 and showed tremendous speed at times with the No. 5. Riding twelfth in the current driver standings with three top five finishes this season, Devendorf hopes to crack the Fast 14 qualifiers this year and keep himself in a top ten battle all day long throughout the 200. A steady drive will see Devendorf as a lock in the top ten at day’s end, with a top five run certainly in the cards. Devendorf ended his 2014 Classic in 19th, just behind Shullick. 6 – Davey Hamilton (Boise, ID): The winner of the 1997 International Classic driving for Mike Muldoon, Davey Hamilton has knocked on the door step of victory yet again several times in the Classic, driving for John Nicotra. Hamilton took second in 2012, battled up front all day in 2013 before his rear wing came apart, and finished third in 2014. Despite only competing at the Speedway once this season back on May 9 with a dismal 19th place effort, Hamilton will be one of a handful of drivers with a sure shot at victory in the 200 come Sunday, September 6. 7 – Otto Sitterly (Canajoharie, NY): One of the other drivers with a sure shot at victory in the 59th International Classic is the defending champion and four-time winner of the great race, Otto Sitterly. Taking top honors in 2009, 2011, 2012, and 2014 – Sitterly has five Novelis Supermodified wins at Oswego this season and may very well be the odds on favorite for another back to back triumph in the 200. Sitterly has made his career on big time wins at Oswego and a fifth Classic title would tie him with the legendary Ed Bellinger Jr. all-time. 9 – Stephen Gioia III (Oswego, NY): The second generation Gioia driver, Stephen Gioia III has been a weekly fixture at Oswego this season but has struggled to come up with the results he would like in 2015. In a car built by his father Steve Jr., the winner of the 1976 International Classic, Gioia has showed glimpses of speed in the No. 9 and hopes to see it return on Labor Day Weekend. Gioia will likely be a second round qualifier come Sunday and will look to better on his performance in the 2014 Classic which saw him complete just four circuits, in 34th position. 11 – Aric Iosue (Oswego, NY): One of the rookie competitors this season looking to make his first start in the Classic is ‘The Flying Pharmacist,’ Aric Iosue. A longtime Supermodified crewman, Iosue strapped the helmet on in competition for the first time in 2015 and has showed his share of great speed in the No. 11 this season. Iosue finished sixth in the Speedway’s Summer championship back in July and has been in the 16-second bracket a number of times during the regular season. Driving the same car that took Bobby Santos to a fourth place finish in the 2014 Classic, Iosue should time into the field without issue on Sunday afternoon. 15 – Michael Muldoon (Baldwinsville, NY): Joining Brandon Bellinger as a first time winner in 2015, Michael Muldoon carries two main event wins into the 59th annual Classic, driving for his father Mike. Showing tremendous speed all year long, Muldoon should be a shoe in for a Fast 14 qualifying spot, and based on his feature runs this season, another driver with a look at victory in the 200. Muldoon took tenth in last year’s edition of the great race. 21 – Kody Graham (Liverpool, NY): For the second year in a row, Kody Graham won the final Novelis Supermodified main event of the season prior to the International Classic. Graham hopes that he can back that up with yet another front row qualifying spot for the 200 in the No. 21. Showing front row speed all year long, Graham is fifth in Oswego’s driver standings, and seems to have put all the pieces in place for a run at victory in the 2015 Classic. Since the newer Xtreme chassis debuted a few years back, reliability has been the question in the 200, but if the ride goes the distance, Graham will battle in the top five. 22 – Pat Lavery (Oswego, NY): Pat Lavery may have been the toast of the town in last year’s Classic, pitting for a new left rear tire and charging back through the pack for a career best second place run in the 200. Lavery has not been in contention for victory so far in 2015, but a well-paced racecar and smart driving has Lavery sixth in the driver standings, again listed as a favorite in the Classic. Chatter in the pit area has Lavery again tabbed for another pit stop in 2015, and if so, keep an eye on the No. 22 again working through the field with a podium finish in sight. 23 – Mike McVetta (Wellington, OH): Joining Aric Iosue as a rookie contender in 2015 is Ohio winged Supermodified veteran, Mike McVetta. McVetta, a NASA engineer who builds his own racecars, has been coming to the Oswego Classic for years as a fan and will finally give the 200 a go in ’15. McVetta has an ISMA and MSA Supermodified victory this season, each at Lorain County Speedway in Ohio. In a racecar that has never competed without a wing, McVetta will hope that all the pieces of the puzzle come into place on Sunday afternoon, helping him to park the No. 23 on the front stretch for the International Classic starting lineup. 24 – Jerry Curran (Oswego, NY): Like Shawn Muldoon, Supermodified veteran Jerry Curran has only been to the Speedway a couple times in 2015 with the Nuclear Banana No. 24. Always at the Speedway with a beautifully prepared machine, Curran hopes his 2015 Classic goes somewhat smoother than in 2014. Last year Curran hit the wall during Friday warmups, forcing him to the Bud Light B-Main, which he would go on to win. Curran would then drive masterfully from 29th position to 12th in the 200. If all goes well during warmups Friday and Sunday, Curran should likely time into the show, giving himself an easier shot at a top ten run come Sunday evening. 26 – Shaun Gosselin (Fox Lake, IL): Coming in from the Chicago area each week to compete at Oswego, Shaun Gosselin seems to be hitting his stride at the right time with the No. 26. A podium finish in the last race prior to the Classic has Gosselin and team eyeing another top notch run in the Classic. Finishes of sixth in 2012 and third in 2013 prove Gosselin and team have what it takes for another podium effort in 2015. 35 – Bob Magner (Oswego, NY): Each year the Classic draws one-off entries and one of those drivers in 2015 is Bob Magner, driving the No. 35 Supermodified piloted in recent years by Jeff Holbrook. The Allegresso built machine has shown Fast 14 speed as recently as 2012, and two-time Mr. Supermodified Magner is no doubt capable of giving it another great drive. Magner last competed in the Classic in 2013 with a finish of 22nd, and has spent the last couple seasons mixing it up on the ISMA Supermodified trail. 47 – Bob Bond (Mexico, NY): Two-time Classic champion and current Novelis Supermodified point leader at Oswego, Bob Bond is another of the drivers banking on victory in the International Classic. Once again driving the Four Sevens Motorsports No. 47 Hawk, Bond has one victory this season and multiple top five efforts to lead Sitterly in the overall drivers chase. With Fast 14 speed and a knack for long distance driving, Bond hopes to rebound from a disappointing 20th place run in last year’s 200, which saw him with a flat right rear and damaged racing machine. 50 – Dave Gruel (Fulton, NY): Yearly Oswego championship contender Dave Gruel is another driver eyeing Classic victory. Finishing third in 2012 and fifth in 2013, a rare stumble last season saw Gruel with a 16th place effort. With one feature victory in 2015 and a fourth place ranking in the current driver standings, Gruel hopes to be one of those dicing for victory at race’s end on Sunday. 51 – Joey Moriarty (Glendale, AZ): A familiar name is returning to Classic contention in 2015, driving a familiar number – Joey Moriarty will return in the No. 51 for his first International Classic since 1995. A rookie in the 1990 Classic, Moriarty started his Classic career in a big way with a fourth place finish behind only Bentley Warren, Dave Shullick Sr., and Pat Abold. A ninth place finish in 1991 and another top ten in 1994 made Moriarty a fan favorite in his early career. But, it has been 20 years since the Arizona driver has started the Classic, spending the last several years on the dirt out west. Moriarty returns this season driving a brand new Hawk chassis, which he has tested several times this year, displaying Fast 14 speed in the 16.4-second bracket. Moriarty will likely time in on day one and from there only time will tell if Moriarty can again return to the top ten of the Classic. 52 – Dave Danzer (Oswego, NY): Former Mr. Supermodified title holder Dave Danzer has one feature win in 2015 and is one of the fastest racers at the Speedway every Saturday night. Danzer was in the thick of the winning conversation in last year’s Classic, until spinning late in the going. The No. 52 did rebound for an eighth place finish, and will no doubt better that effort if the machine stays forward the entire distance. Danzer qualified fourth quick one year ago with a lap of 16.0-seconds, and is another of the favorites for Classic victory this season. 54 – Dalton Doyle (Fulton, NY): Unlike Aric Iosue and Mike McVetta, Classic rookie Dalton Doyle has zero laps of experience in a Supermodified heading into Classic Week. A three-time winner in the Pathfinder Bank SBS division, Doyle led the Small Block standings for much of 2014 and has landed a ride in the Tim Devendorf back-up Supermodified, formerly driven by Greg Furlong. Testing dates leading up to the Classic will help get Doyle up to speed as the lead fabricator at Hawk Jr. Fabrication looks to make his first Supermodified feature the biggest one there is, the International Classic 200. 55 – Keith Shampine (Concord, NC): Like Shaun Gosselin, Keith Shampine travels a great distance to be a part of Oswego Speedway and the Novelis Supermodified division, as the driver of the Chris Osetek No. 55 hauls from Concord, NC each week. Driving a machine designed and built by car owner Osetek, Shampine has been searching for consistent speed all year. Three top ten finishes in weekly action have seen Shampine competitive and a Fast 14 qualifying effort in 2013 bodes well for the No. 55 come Classic time. Shampine will likely be on the edge of a Fast 14 spot on Friday night of Classic and hopes to see the checkered flag in the Classic itself, something he has yet to do in the Osetek No. 55. 56 – Hal LaTulip (Oswego, NY): Hal LaTulip will once again drive through the Oswego gates on Classic Weekend with the No. 56. Driving a chassis of his own design, LaTulip has brought the No. 56 to Oswego every week this season, continuing to build speed toward qualifying for another 200. LaTulip fell short of the starting grid in 2014, but made the show as recently as 2013 with a 25th place run. The Classic would not be quite the same without the LaTulip No. 56 on the roster. 68 – Michael Barnes (Mexico, NY): Coming to many as a surprise, Michael Barnes has not yet reached victory lane at Oswego Speedway in 2015, driving the Syrell Racing No. 68. The first driver to officially crack the 15-second bracket in a Novelis Supermodified, one year ago during Classic time trials, Barnes is a threat for the Classic pole position again in 2015. Several podium finishes this season and two wins in 2014 make Barnes another favorite for the 200 victory as he looks to improve on his sixth place run one year ago, looking to score his first career Classic top five. 72 – Dave Cliff (Oswego, NY): Officially announced during the final Supermodified event of the regular season at Oswego, with a career best runner-up finish, Dave Cliff will indeed continue behind the wheel of the Danzer No. 72 for the 59th International Classic. Starting the season behind the wheel of his own No. 06 machine, Cliff opened eyes with a few fine attempts, before getting the call to drive on the Danzer team for the 200. The car that Cliff will pilot took Danzer to a fourth place finish in the 2011 Classic. Cliff, who ran the 2010 Classic for Pat and Terry Strong and the 2013 Classic in his own ride, will look to make his third start on September 6 for a third different car owner in Craig Danzer. 79 – Brian Sobus (Fulton, NY): Brian Sobus had his coming out party as a Novelis Supermodified car owner during last year’s International Classic Weekend, surprising the crowd with a 16.4-second lap, putting him in as the final of the Fast 14 qualifiers. Unfortunately Sobus would be one of the first cars out of last year’s 200, but Sobus bounced back in 2015 driving his No. 79 to two runner-up finishes this year, including the 75-lap Jim Shampine Memorial in May. Showing solid speed this season, Sobus will look to try and return to the front seven rows of the starting grid in 2015, and may well be one of the surprise contenders for victory if he makes it the distance. 83 – Lou LeVea Jr. (Fulton, NY): Another weekly runner at Oswego, Lou LeVea Jr. is one of the competitors working all season to better his program with a starting spot in the International Classic in mind. Driving an older Belfiore chassis, the LeVea crew has worked hard all season to put themselves in position to once again make the 200, which they have done each of the last two seasons with a best finish of 20th in 2013. Driving the No. 83, LeVea may have to race his way into the show, but another starting spot and the $1,000 prize that comes along with it, will be mighty satisfying for this crew. 88 – Ryan Litt (London, ONT): A veteran of winged Sprint Car racing, Ryan Litt stormed onto the Classic scene back in 2013 driving the Dave Lair Jet No. 88. The son of former Supermodified driver Wade Litt, Ryan qualified seventh fastest and finished with an amazing fourth in his first Classic two years ago. Last year, Litt struggled with the No. 88, running the Bud-Light B-Main and ending his day with a disappointing 28th place effort. Litt is scheduled to return yet again in 2015 and is looking to return to the form he first showed only two years ago in his rookie season. 91 – Bobby Santos (Indianapolis, IN): Driving for Graham Racing for the second consecutive season, Bobby Santos will return to Oswego for another shot at Classic victory in 2015. Santos first came to Oswego as a teenager in 2002, driving for Dave Lair. The young shoe made an immediate impact, time trialing into the show with a 15th place finish. One year later Santos timed in 6th quick, before dropping out. In 2004, driving for Craig Rayvals, Santos nearly won the Classic – crashing across the line with Greg Furlong. Despite excelling in various other racing series’, Santos continues to return to the Classic and as recently as last season scored another top five finish driving the Graham No. 11. This year Santos will pilot the No. 91, driven the majority of the season by his car owner Ray Graham, and will surely make himself known as a pole and winner threat in this year’s field. 96 – Lou LeVea Sr. (Volney, NY): Lou LeVea Sr. started the 2015 season driving the No. 66 Supermodified built by his car owner Steve Buske. Unfortunately, an accident earlier in the year sidelined that ride, moving LeVea to the former Kerfien Racing, Page Chassis, No. 96. Like his son Lou Jr., a starting spot in the Classic is a crucial result in the overall success of Lou Sr.’s season. Last year, LeVea wheeled his way into the 200 as the fifth and final qualifier out of a stacked Bud Light B-Main. This year, LeVea hopes he can muster the speed to qualify in day two time trials. 99 – Joey Payne (Fairlawn, NJ): One year removed from starting on the pole position for the International Classic with a new track record of 15.802 seconds, Joey Payne is reunited with his former Oswego team in Strong Racing. Payne and car owners Pat and Terry Strong competed at Oswego just once this season, in a shakedown of the No. 99. A veteran of the Classic, Payne hopes to find a Fast 14 qualifying spot and then put himself in position to finally win the Classic. The ride that Payne will chauffeur last ran in the International Classic in 2013, ending in the eighth position with Michael Barnes at the controls. The cars listed above have contacted the Speedway in regards to running the 59th International Classic. The cars listed below are potential additions to the field. 3 – Brian Sweeney: Rumors have recently circulated that Brian Sweeney may bring his No. 3 Supermodified out of the garage for an attempt at the Classic. Sweeney qualified 15th fastest in last year’s Classic field, ending with a 24th place finish. 18 – Howard Page: Page has been to the Speedway a handful of times this season with the No. 18, but not in recent weeks. After time trialing 27th fastest one year ago, Page finished 32nd in the 2014 edition of the 200. 45 – Mike Barbera: The Mike Barbera owned No. 45 made a surprise visit to the Speedway on August 15 and is rumored to have one of two veteran drivers at the wheel come Classic Weekend. It is said that both Russ Wood and Tim Jedrzejek have been contacted to drive the Muldoon chassis No. 45 this Labor Day Weekend. The Barbera machine qualified for last year’s Classic through the Bud Light B-Main with Mike at the wheel, finishing 31st overall. 66 – Buske Racing: Car owner Steve Buske has declared intentions to potentially enter another machine for the Classic as No. 66. The car is said to be the twin to the No. 96 machine entered in the Classic by Lou LeVea Sr. A driver had not been discussed for this car. 70 – Dave McKnight: After failing to qualify for the 2014 International Classic, driving for Gary Morton, it is unclear if McKnight or Morton will return for the Classic in 2015. 75 – Gene Lee Gibson: Gibson failed to qualify for the Classic in 2014 driving his own No. 75. Earlier in the year Gibson was said to be coming to the Speedway for the August 8 Anniversary night, but never made it to the Speedway. 84 – Mike Lichty: Lichty qualified for last year’s Classic driving a former John Nicotra owned machine and looked stout in the No. 84 prior to dropping out of the event on lap 165. While Lichty has not filed an official entry, the word is that Lichty will indeed return with the same car in 2015. 94 – Logan Rayvals: Rookie Supermodified driver Logan Rayvals has been at the Speedway twice in 2015, qualifying for one main event. A former NEMA Lites shoe, Rayvals competes in the former Locke Racing machine driven in last year’s Classic by Randy Ritskes. While Rayvals has not filed an entry for the Classic he is expected to be one of four rookies competing for Total Seal Rookie of the Race honors, worth $500.